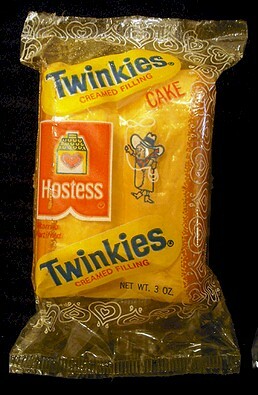 The original Twinkies were banana flavored. That stopped shortly after World War II, when bananas were in short supply. When they try to go retro on us and put out Banana Twinkies today, they really aren't the same because they use imitation banana flavoring. Would semi-freeze them before eating. Delish! Greasy things tho, probably made with lard. A happy update: A new incarnation of the Hostess Brands company was formed in 2013, and production of Twinkies and the other Hostess cakes resumed in June 2013. Liked them but not my favorite.....spongy. I'd buy a Ring Ding instead. I didn't mean to open a can of worms, and I know this isn't a political forum. However, I must respond. The executives of Hostess took huge bonuses as the ship was sinking rather than give any concessions to the workers. Executives' greed killed Hostess, not Unions. Let's put the blame where it belongs. Alan, you're right about the Union wanting better pay and working conditions. I worked for a company that was not Union and when it was about to come in to the company, the boss man gathered his 150 employees and told them that if they went Union, he would close the doors immediately. No Union-- and better working conditions and better pay went out the window. Unions - Democrats - what's the difference? They ruin EVERYTHING. Or you can thank the union that tried to squeeze money out of a company that already had serious financial problems. Now, not only do the workers not have the increase that they (the union) wanted, they also don't have their jobs. Congratulations. Thank management who tried to squeeze every penny out of the workers; the Union was not the guilty party unless wanting decent wages and working conditions is something to be guilty about. As I understand the situation, Hostess may be going bankrupt, but they could sell off their brands/products to others. So there's a chance that Twinkies and Hostess cupcakes could stick around. They got their name when an executive of the company, while driving through St. Louis, saw a billboard for the Twinkletoe Ballet Shoe Co.